Don’t be fooled by the lively illustrations in this great new book. It’s surprisingly informative and still a lot of fun. It’s not some outlandish tale about an anthropomorphic crocodile-like creature. The actions taken are real actions a crocodile might take. The focus is on two things – how a crocodile hunts and how a crocodile is born and grows. Crocodiles are smart enough to know the places that animals come to drink water. They will lie motionless, with just the top of their heads above water, until an animal gets close enough to grab. They only need to feed again when they’ve digested the meat available on the caught animal. The mother crocodile lays her eggs in the sand and tends them, adjusting the number of leaves covering them to regulate the temperature. She then protects the small babies as best she can. 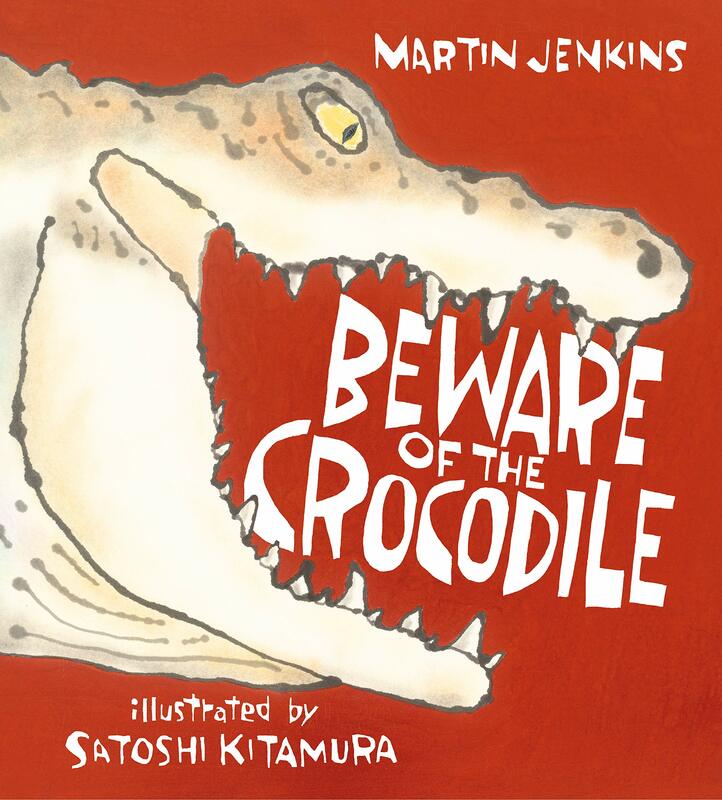 Of course, crocodiles really are scary, but the scariness in this book comes from real crocodiles, not cartoons. Recommended for classroom units on nature. First released in 2008, this highly informative and entertaining book has been revised and updated for a new audience and for new data. 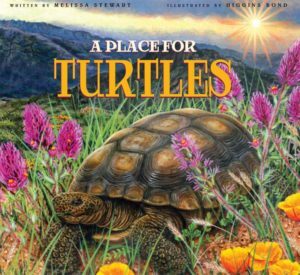 Each informative two-page spread includes a problem that turtles currently face and possible solutions and ways readers can help turtles. Much of the background and information is revealed in sidebar fashion, making it more accessible to teachers and parents. This is truly for a family and schoolroom discussion. Beautifully realistic illustrations help readers relate to the turtles. Introduction of exotic plants has destroyed much of the turtles’ landscape. When people add fish to lakes and ponds, they may be squeezing out turtles. Some fishing equipment is harmful to turtles. Plastic shopping bags can be ingested, causing death. People have eaten too many of the beautiful creatures. Dogs often harm turtles. Turtles used for amusement causes many problems. Turtles often get killed on roadways. Humans often encroach on turtle habitat. The key is to leave them alone as much as possible and help where necessary. Highly recommended for home and classroom. Adorably detailed illustrations are the added touch that makes this cute new book delightful for early readers. Of course, the use of fuzzy dogs doesn’t hurt the readablility either. 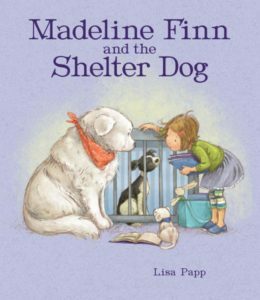 The variety of pets shown and their toys and equipment help make this a book kids will want to read. Madeline is waiting for her new puppy to get old enough to live at her home. Meanwhile, through connections to a local shelter, she becomes attached to some of the shelter’s dogs too. She soon realizes that just speaking to the shelter dogs seems to make them happier. She invites her friends to come with her and read to the dogs. She wants to make sure every dog gets a little extra attention. The idea is such a hit that the library is overwhelmed by check outs. And Madeline’s favorite shelter pup finds his forever home. This could be an inspiration for kids to read at the shelter or just become a favorite bedtime book. Highly recommended as a reference to keep on hand for further study. Great way to keep kids engaged. How do microorganisms feel about our many efforts to wipe them out? 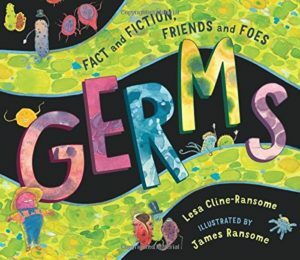 This humorous look at the history of germ warfare attempts to answer that question by showing that germs have always been around us and always will be. The author states that she has struggled for years to get her children to wash their hands. Hopefully this look at the germ world will encourage hers and all children to realize the importance of that simple gesture. It’s also important to realize that many microorganisms are not only desirable but essential to our existence. This is a great place to begin learning about the love-hate relationship we have with these organisms. The author begins with an overview and quickly moves on to the era in which bacteria were discovered. The work of Anton van Leeuwenhoek and Louis Pasteur are highlighted and delightfully illustrated. The war to contain microorganisms and to propagate the “good” ones goes on. Knowledge and vigilance are our best weapons. With poetry and a little bit of humor, the author imparts a lot of information about the Earth and her components. 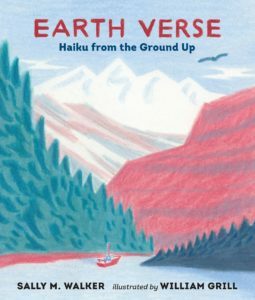 The haiku form is perfect for exploring the not-so mudane and showing just how wonderful our world is. Impressionistic colored-pencil illustrations bring forth many images to the reader’s mind. The author starts off with the Earth in her entirety. She then investigates minerals, rocks, and fossils. She then moves on to earthquakes and volcanoes. Atmospheric and surface water, glaciers, and groundwater come last. Each has at least one haiku and a full page of background. This is a great place for kids to start learning about both the Earth and about poetry. The reader should try their hand at writing their own haiku about the world around them. 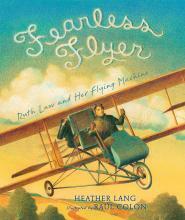 In the early days of flight, many women and men distinguished themselves as clever, hardy, and fearless. None was more fearless than Ruth Law. 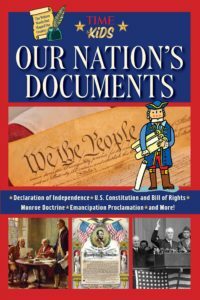 Packed with information about Law’s most famous flight. This marvelous picture book appeals to the imagination and shows that nearly anything is possible with skill and determination. Agai-nst all odds, Law flew form Chicago to New York City – much of it nonstop – in 1916. The author does a beautiful job of showing how difficult that flight was. With an old plane, in frigid weather, and with everyone telling her it was impossible, she did it! She even wore a skirt because women must. The author’s research was meticulous and she shows how a story can be both accurate and exciting. Wonderfully action-packed illustrations accompany the text. The reader will feel they’re flying along with Law and even sense the bite of the wind and her joy at being airborne. Great tie-in with early twentieth century history, flight, and women’s history. In a little-known but somewhat amusing incident in his youth, Abraham Lincoln participated in a duel. 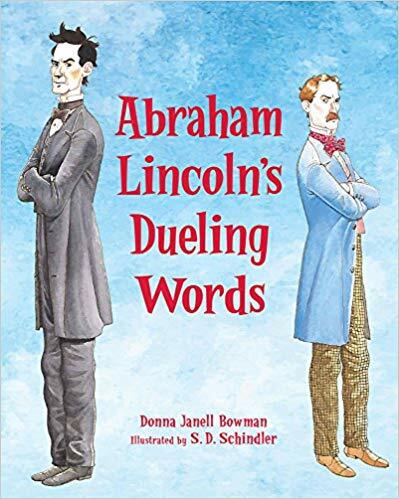 The reason it’s not widely known is that Lincoln was so embarrassed by the episode, he swore to never insult anyone again and did not talk about the duel. James Shields was a Springfield attorney in 1842, just like Abraham Lincoln. He was also state auditor, and Lincoln disagreed with his solution to a banking issue. Just to poke fun at Shields, Lincoln wrote a letter to the local publication of the Whig party and signed it Aunt Rebecca. Folks enjoyed Lincoln’s letter so much, they continued writing letters as Aunt Rebecca and making fun of Shields. Shields was livid and demanded to know who insulted him. Lincoln’s name came up as one of the letter writers. Shields challenged Lincoln to a duel. As the object of the challenge, Lincoln could make up his own rules. He devised impossible rules with swords as the weapons. Lincoln ended up apologizing, with Shields accepting. Anecdotes such as this are priceless ways to get acquainted with historical figures who are otherwise larger than life. 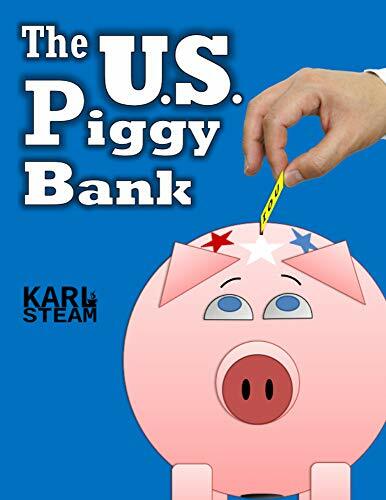 The author weaves an entertaining and humorous tale. The illustrator follows right along by helping the figures come alive. This would be fun as independent reading but more fun as a read aloud with plenty of room for discussion. It may seem a little early to start thinking about Christmas stories, but this charming addition to Nutcracker lore is well worth a look. It may be time to start learning about the ballet in preparation. This version revolves around two young females – a girl named Irina whose parents work at the Mariinsky Theater in St. Petersburg and a dancing mouse named Esmeralda – at the time of the first performance of the Nutcracker Suite. Irina and Esmeralda become unlikely allies when the theater tries to rid the theater of the mouse population. Irina loves mice and Esmeralda loves the doll clothes/ballet costumes Irina sews. The mouse ballet company uses a space behind the walls as a theater of their own and use the music provided by the theater’s orchestra. 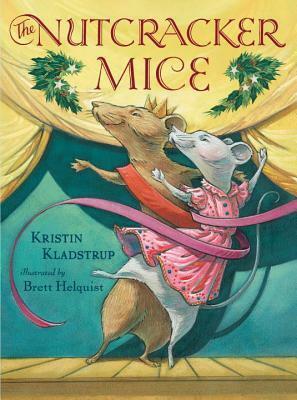 They change the story to Clara and the Mouse King so the mice can win and to add some romance. The illustrations are fun, creative, and detailed, adding much to the story. The reader can learn a lot about the music and story behind the Nutcracker, a lot about ballet, and a little about Russia as well. The mouse characters seem almost real, so the fantasy is nearly forgotten. This would be a great read-along chapter-by-chapter for a younger child or a fun story for older children to tackle.